A haunted hotel built by a serial killer, a coven of witches with unthinkable powers, a mental asylum run by lunatics and a carnival freak show like no other.. these dark, disturbing settings are the backdrop for our latest 3″ blind-boxed TITANS collection! Titan Entertainment is thrilled to partner with 20th Century Fox and present the most twisted, iconic characters from the first six seasons of Brad Falchuk & Ryan Murphy’s beautifully-twisted TV epic, American Horror Story. 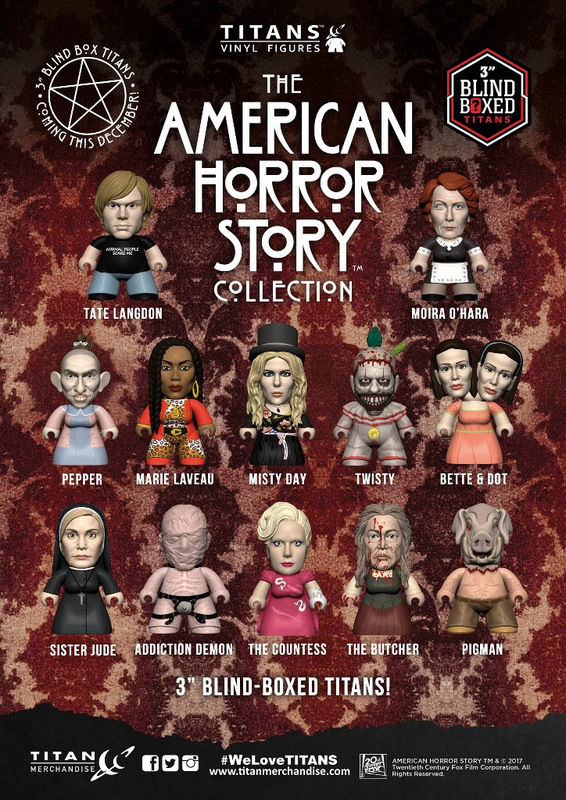 Stuffed to the brim with horrific absurdities like the drilldo-wielding Addiction Demon, the terrifying Pigman, the murderous Butcher and three of the most memorable freaks from Season Four’s Freak Show, this collection is a must-have for any discerning horror addict. Each figure is 3” blind-boxed – and some of them come with an awesomely-lethal character-specific accessory. PLUS: 4 rare chase figures (and one super-rare – and even one ultra-rare – chase figure) for you to hunt and collect!